Saying he was "deeply sorry and ashamed," Bernard Madoff pleaded guilty Thursday to pulling off perhaps the biggest swindle in Wall Street history and was immediately led off to jail in handcuffs to the delight of his seething victims. Applause broke out in the packed courtroom of around 100 spectators after U.S. District Judge Denny Chin denied bail for Madoff, 70, noting that he had the means to flee and an incentive to do so because of his age. Madoff stood stoically, if a little pale, at the judge's ruling, reports CBS investigative producer Pat Milton. Madoff could get up to 150 years in prison when he is sentenced in June. The plea did not satisfy many investors who had hoped Madoff would be forced to name any family members or others who helped him swindle them out of billions of dollars. He pleaded guilty to all 11 charges against him - with no deal with prosecutors - meaning he is under no obligation to disclose names and tell authorities where the money went. He is not believed to be cooperating with prosecutors. "I am actually grateful for this opportunity to publicly comment about my crimes, for which I am deeply sorry and ashamed," Madoff, speaking softly but firmly, said in his first public comments about his crimes since the scandal broke in early December. DeWitt Baker, an investor who attended the hearing and said he lost more than $1 million with Madoff, called it "fantastic" that Madoff's bail was revoked but belittled the apology. "I don't think he has a sincere bone in his body," said Baker, who added that prison time would be too good for Madoff. "I'd stone him to death." Madoff did not look at any of the three investors who spoke at the hearing, even when one turned in his direction and tried to address him. The fraud, which prosecutors say may have totaled nearly $65 billion, turned a well-respected investment professional - he was once chairman of the Nasdaq exchange - - into a symbol of Wall Street greed amid the economic meltdown. The public fury toward him was so great that he was known to wear a bulletproof vest to court. Madoff pleaded guilty to charges including fraud, perjury and money-laundering, telling the judge that the scheme began in the early 1990s, when the country was in a recession and the market was not doing well. "While I never promised a specific rate of return to any client, I felt compelled to satisfy my clients' expectations, at any cost," he said. He said he accepted investors' money but didn't put it into the market. Instead, he sent them phony account statements showing that they were making money. It was a Ponzi scheme, or a pyramid, in which early investors are paid off with money taken in from later investors. "When I began the Ponzi scheme I believed it would end shortly and I would be able to extricate myself and my clients from the scheme," he said. "However, this proved difficult, and ultimately impossible, and as the years went by I realized that my arrest and this day would inevitably come." The scheme evaporated life fortunes, wiped out charities and apparently pushed at least two investors to commit suicide. His victims exceed a staggering 13,000 - 162 pages of names who say they lost something or everything, reports CBS News correspondent Jeff Glor. They range from elderly Florida retirees to actors Kevin Bacon and Kyra Sedgwick and Nobel Peace Prize winner Elie Wiesel. Madoff implicated no one else, though investigators suspect relatives and top lieutenants may have been in on the scheme. Federal prosecutors are investigating his wife, sons, and brother, as CBS News chief investigative correspondent Armen Keteyian reported last night. "The SEC did not do their job. They were negligent, they were ineffective. … They lured people into a false sense of security," Phyliss Molchatsky, a retiree who lost her life savings, told The Early Show. Molchatsky says she plans to sue the SEC. Another victim, Dr. Henry Backe, told The Early Show that Madoff was an "economic terrorist." In Washington, White House spokesman Robert Gibbs said: "The president is glad that swift justice will happen." Gibbs said the Obama administration will do everything possible to ensure strict enforcement of securities regulations "and hope that through those actions that that kind of greed and irresponsibility and that kind of criminal activity never happens again." The financier, who has spent three months under house arrest in his $7 million Manhattan penthouse, will be sentenced June 16. In addition to prison time, he faces fines, mandatory restitution to victims and forfeiture of ill-gotten gains. After arguments began as to whether Madoff should remain free on bail, his lawyer Ira Sorkin described the bail conditions and how Madoff had, "at his wife's own expense," paid for private security at his $7 million penthouse. Loud laughter erupted among the spectators crammed into the large courtroom on the 24th floor of the federal courthouse in lower Manhattan. The judge warned the spectators to remain silent. Before accepting the plea, the judge gave investors a chance to challenge his conclusion. 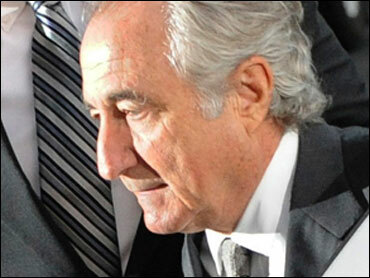 One former client said she objects to Madoff's guilty plea until the money lost can be found. Another, Maureen Ebel, wanted to see the case go to trial so the public would have "more of a chance to comprehend the global scope of this horrendous crime," reports Milton. He also let burned investors challenge his decision whether Madoff should be go to prison immediately. The fact that Madoff had been allowed to live in his Manhattan penthouse after his arrest "really infuriates everyone," said Matt Weinstein, a motivational speaker who lost the bulk of his savings in the scheme. If Madoff is sentenced to more than 25 years, he will serve out his prison term in a maximum security facility, said CBS' The Early Show legal analyst Lisa Bloom. For as angry as victims are toward Madoff, some also lay blame at the door of the Securities and Exchange Commission. People familiar with the case tell CBS News that federal investigators are "ripping apart" 20 years of fraud inside Madoff's firm. They're moving beyond Madoff himself and looking at sons Andrew and Mark, who directed trading activities, and brother Peter, the company's chief compliance officer. None of them have been charged with any wrongdoing. Also under the microscope: Madoff's wife of 49 years, Ruth, who has not been charged in the case. In court papers, she claims nearly $70 million in assets separate from her husband's fortune, including a $7 million New York apartment, $45 million in bonds and $17 million in cash. She's also listed as the owner of a $9 million Palm Beach, Fla. mansion. "Just because Madoff apparently won't cooperate with authorities doesn't mean we won't perhaps see charges against other people here," said CBS News legal analyst Andrew Cohen. "There clearly is a paper trail, and clearly people were handling the details of the phony trades, and the investigation is ongoing. When there is this much money at stake the trail won't grow cold here or now." At the hearing, prosecutor Marc Litt said that the investigation is continuing and that "a lot of resources and effort are being expended to find assets and anyone else who might be responsible for this fraud," reports Milton. Investigators say the true amount lost by investors may be between $10 billion and $17 billion and the larger estimates by Madoff include the false profits prosecutors say he generated with tens of thousands of bogus account statements cataloguing steady profits. So far, authorities have located only about $1 billion in assets.